Tag line: "Blacula! - Dracula's Soul Brother!" A cross between Blaxploitation and horror, 1972’s Blacula tells the story of Wamuwalde (William Marshall), an African Prince who, in the latter part of the 18th century, traveled to Europe with his wife Luva (Vonetta McGee) to negotiate an end to the slave trade. Unfortunately, the first aristocrat he meets with is none other than Count Dracula (Charles Macaulay), who put the bite on Wamuwalde, thus transforming him into a vampire. To add insult to injury, Dracula then locks the Prince inside a coffin, dooming him to spend the rest of his unnatural life cut off from the human blood he now craves. Almost 200 years later, a pair of interior decorators (Ted Harris and Rick Metzler) travel to Transylvania and buy up all of Dracula’s old furniture, shipping it to America to sell as antiques. Once back in L.A., they pry open Wamuwalde’s coffin, inadvertently unleashing the bloodthirsty vampire on the unsuspecting populace. Dr. Gordon Thomas (Thalmus Rasulala), a forensics expert working with the Los Angeles Police department, is the first to notice something strange is going on when he inspects the bodies of several murder victims and finds they’ve been completely drained of their blood. While Gordon and Lt. Jack Peters (Gordon Pinsent) are busy piecing together the clues, Wamuwalde is wooing Tina Williams (also played by Vonetta McGee), the sister of Dr. Gordon’s girlfriend, Michelle (Denise Nicholas), who is the spitting image of his late wife, Luva. As more and more people rise from the dead, each with a hunger for human blood, Dr. Gordon and the police quickly realize they’re dealing with a vampire, and work tirelessly to bring the chaos to an end. With its funky soundtrack (including a few live performances by The Hues Corporation) and urban setting, Blacula has the look and feel of a Blaxploitation movie. What sets it apart, of course, is its focus on horror as opposed to crime, yet while Wamuwalde is definitely a monster, he’s also the film’s most sympathetic character. As portrayed by Marshall, Wamuwalde is a tragic figure, a loving husband who's fight for justice came to an abrupt end when he crossed paths with a vampire. When his thirst for blood is at its strongest, Wamuwalde looks downright terrifying (he almost resembles the Wolfman), but most of the time he’s a normal guy, longing to rekindle the love that was stolen from him so many years ago. With his deep voice and commanding screen presence, Marshall is excellent as both lover and killer, giving us a lead character we feel sorry for, yet who can also scare the daylights out of us (the scene where he surprises a victim in her home is arguably Blacula’s most frightening moment). Marshall’s performance, combined with a solid turn by Rasulala (essentially playing this films version of Van Helsing) and some spine-chilling vampires (looking damn creepy with their pale skin and sharp teeth, and acting like animals at feeding time whenever they get hold of a new victim), Blacula strikes the perfect balance between Blaxploitation and horror, making it a must-see for genre fans. Classic blaxploitation! Nice write up! "Blacula strikes the perfect balance between Blaxploitation and horror, making it a must-see for genre fans." 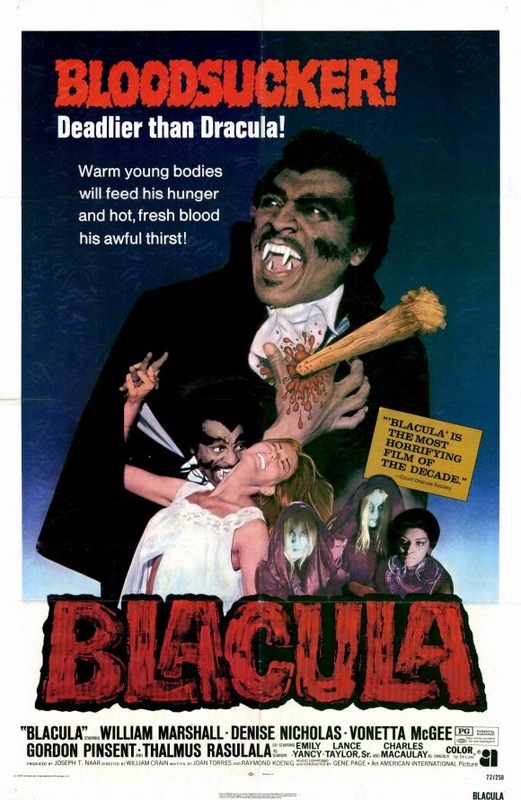 - I will be sure to pass on this cool write-up on Blacula, because it IS that time of year. Spooky and scary!